Staffordshire Bed and Breakfasts. Compare latest rates and Live availability for all your favourite places and places you have always wanted to go using our new My Shortlist feature. Click + to add to your Shortlist. Bed and Breakfasts in Staffordshire for 1 night from Wed Apr 24, 2019 to Thu Apr 25, 2019 within 50 miles, in an Average Nightly price range of £1 to £200. The Saracens Head is located in the heart of the Staffordshire countryside. We boast a characterful gastropub with pub classics, real ales and a bespoke gin selection. Our bedroom offering comprises of 5 luxury en-suite rooms starting from 㿼 per night. Weston Hall originated in 1550 when it was built as a small dower house. In early 2012 the Petrouis family took on Weston Hall with a view to making major refurbishments over a 6-month period. After restoring the building to its former glory Weston Hall re - opened on 16th November 2012. The Hall now incorporates The Cellar - an informal dining venue and an event venue with luxury accommodation. Our new casual dining area The Cellar provides the perfect excuse to visit this beautiful building on a regular basis! The Cellar will specialise in serving classic English dishes made from locally sourced produce. Expect to see a selection of steaks homemade pies and other favourites on the menu. The Cellar Bar & Lounge will also serve tasty cakes and sandwiches throughout the day and cocktails pre-dinner drinks and bar snacks in the evening. By day The Cellar Bar & Lounge will serve delicious afternoon teas. Enjoy a selection of delicate sandwiches warm scones with clotted cream and preserves along with an assortment of homemade cakes all presented on a traditional tiered platter. Alternatively you ll have the option to upgrade to a celebration afternoon tea which includes a flute of champagne why not All eight bedrooms including our honeymoon suite are located on the top floor of Weston Hall allowing for views far over the Staffordshire countryside. These bedrooms will be available for use 7 nights a week providing the ideal place to escape unwind and enjoy the views far across the Staffordshire countryside. At Weston Hall every bedroom is individually designed and furnished comfortable robes and luxury White Company toiletries are all included to be in keeping with the high standards you would expect from this magnificent venue. Please note: Only continental breakfast is included in the room rate. There is a HD Television tea and coffee making facilities hair dryer radio alarm fridge and Wi-Fi. Breakfast is freshly prepared with seasonally locally sourced produce. We offer a warm welcome to all guests who ride hike climb or just wander at your own pace. Cannock Chase Forest offers miles of exhilarating mountain bike trails to suit all ages and abilities there is also are cycle hire facilities close by and on your return we provide a hose for both you and your bike!! The forest also offers lots of lovely woodland walks just cross the road at the top of the drive and you are straight onto Cannock Chase. Maybe you d like to go a little further and enjoy several walks along The Staffordshire Way. Meander through the grounds of Shugborough Hall along canals and nip into any of the little caf� s on route for a spot of lunch. Shugborough Hall also offers a full and enjoyable calendar throughout the year ranging from Iron Man Theatre in the Gardens and Music in the Gardens. Also only a stone s throw away is Blithfield reservoir the home of Blithfield Sailing Club which has a number of open meetings Blithfield Anglers is a trout fishery where you can obtain day ticket and West Midland Bird Club where Blithfield is regarded as one of the best bird watching sites that provide interest all year around. br / br / The National Memorial Arboretum Alton Towers Uttoxeter Race Course etc are all close by. There are several good golf courses in the area and we are within walking distance of Brocton Hall golf club a little further out there is Ingestre Park Stafford Castle Golf Club. With so much to offer why not come and stay and make your weekends memorable. br / br / br / br / Look forward to seeing you soon! Colton House is a special place to stay providing a luxury personal service to all its guests in individually designed bedrooms some with original beamed ceilings ornate plasterwork ceilings or cast iron fireplaces. Beds are extremely comfortable and up to 6 0 wide. Rooms have LCD or Plasma TVs with some as big as 60 one room has its own Wii. Freeview is standard and free Wi Fi is available anywhere in the house and parts of the 1.5 acre garden. There is comfortable seating in each bedroom a hospitality tray and a choice of duvet or blankets/sheets. Each room has a mini bar with beer wine soft drinks water and chocolates. Attention to detail as well as the quiet village setting ensures you have a good night s sleep. br / br / Bedrooms have en-suite bathrooms with shower and bath some with multi jet body power showers others include one with a double ended cast iron roll top bath or another with a 5 dia. round Jacuzzi all have luxury toiletries and plush dressing gowns. br / br / A well-stocked oak paneled bar is open 24/7 a comfortable lounge and a dining room with seating for 24. Breakfast wins awards at a local and national level with a very wide choice. br / br / br / br / Situated in a quiet village close to The National Memorial Arboretum Shugborough Alton Towers Drayton Manor the potteries Cannock Chase Lichfield etc. br / br / Available for conferences team building or corporate events it is ideal for groups up to 30 but can accommodate 80. Companies use the secluded nature of the place to have confidential meetings / interviews or just to walk about and develop ideas with staff or others they wish to work with. For these events you can choose just a coffee or a buffet full sit down meal or for something different perhaps a hog roast. You just have to decide and Ron & Gay will help make the event all you want it to be. br / br / br / br / With all this space and the ability to take over a whole house ideal events are small wedding receptions birthday parties and christenings. Colton House is a Grade II* listed building a boutique hotel with probably the best 4 poster bed in Staffordshire. All 11 rooms are ensuite with baths and showers and are designed with your comfort in mind; all have 21st century facilities and standards. Children 13+. 5* gold accommodation regional B&B winner awards for the quality of breakfasts Staffordshire’s only gold star winner for customer service as well as several green awards. Attractive 1.5 acre garden a quiet secluded area. County Park or Theme Park Our Stafford Central hotel is ideally placed whether you re looking to discover the historic town of Stafford explore the beautiful surrounding countryside or spend an adrenaline-filled day at one of the area s theme parks. It s a short walk to the lively town centre and Stafford FC s stadium and the stunning Cannock Chase AONB is close by. There s lots to visit in the area from the exquisite Shugborough Hall to the exciting Alton Towers. All rooms feature a comfy king size bed with four plump pillows and a cosy duvet. Guests can enjoy a wide variety of food and drink choices within easy walking distance from this hotel. Early/Late Check-In/Out Service if you re looking to make the most of your day we can offer an Early Check-In service from 12:00noon and a Late Check-Out Service until 2pm so you have more time to relax - cost is �10 per service per room subject to availability - bookable direct by telephoning the hotel. We are a pet friendly hotel and allow up to 2 domestic pets per stay. This is at an additional charge of �20 per pet per stay. Please contact LateRooms to arrange this to be added to your booking and for further details on charges and terms and conditions. Please note that Guide dogs Hearing dogs and other animals to aid disability are exempt from charge. The BEST WESTERN Tillington Hall Hotel in Stafford offers a serene backdrop for any stay in the Heart of England. In a leafy setting that offers peace and quiet for romantic getaways weddings or business breaks. The hotel is as conveniently placed as it is pretty within easy reach of Birmingham and Manchester International Airports and close but not too close to Junction 14 of the M6. With a choice of 91 recently refurbished bedrooms flexible conference & events facilities to suit all requirements as well as a lounge bar and restaurant to take care of your taste buds. You ll have everything you need during your stay or stop-over. High View Cottage. AA 4star.En-suite rooms. Uttoxeter. 1 Mile.Racecourse 1 mile. Close to Alton Towers. Price displayed varies. Please contact for quote and offers. Tea/Coffee. Hairdryer.TV. WiFi. Ideal couples and families. Quiet, comfortable private. Named after the 400-year-old tree in its grounds, the Georgian Grade-II listed Cedar Tree Hotel is just 5 miles from the charming cathedral city of Lichfield. It has free Wi-Fi and a bar. Each simply furnished room has a large, flat-screen TV and all rooms have a private bathroom. The lovely forest and countryside of Cannock Chase is a 20-minute drive away, where guests can visit treetop adventure park Go Ape. The hotel offers ample free parking, and Drayton Manor Theme Park can be reached in 15 minutes' drive. The Cedar Tree Hotel is an exceptional grade 2 listed Georgian property dating over 200 years old. Our unique venue inherits its name from the magnificent cedar tree located at the front of the building which is approximately 400 years old. Oozing historical architecture and antique elegance our committed team is always on hand ensuring high levels of customer service in order to achieve the best possible stay with us at The Cedar Tree Hotel Nestled in the heart of the country s most creative county. The Cedar Tree is located in between some ancient landmarks and renowned local beauty spots with the added bonus of being centrally positioned between the M6 and M42 motorway networks. Packed with things to do and see - from the thrills and spills of Altons Towers and Drayton Manor to the serenity of the National Memorial Arboretum. Discover Cannock Chase and the breath taking views of untouched idyllic countryside open heath land and mixed forests also boasting some attractive activities such as walking cycling horse riding Nature trails Go Ape etc. Close by is Lichfield a city that s steeped in heritage and a district that s alive with action and adventure. Housing many historical attractions Lichfields heart is one of England s most treasured and eye capturing the gothic style cathedral. The Cedar Tree s restaurant has an intimate atmosphere and can seat up to fifty people. Only the best of fresh local meats and vegetables are used by our chefs. The traditional atmosphere and welcoming hospitality provides the perfect setting for all informal/ formal celebrations from civil ceremonies wedding breakfasts or evening receptions to christenings birthday parties or dinner dances. The Chetwynd Suite will comfortably seat 250 of your family and friends enabling you to relax and enjoy. Our car park offers free parking for up to 100 cars. The White Hart Hotel is a former coaching inn dating back to the 16th century. Today the partly Grade II listed White Hart is a premier cocktail lounge brasserie and gastro-dining restaurant. The hotel has been restored to glorify its charm and character intertwining this with modern hints of elegance. Each of our bedrooms offer King Size beds with cosy duvets flat screen TV s hospitality tray luxury bathrobes and Molton Brown toiletries as standard. 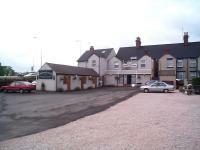 The White Hart Hotel is a hotel located in Uttoxeter. Among the facilities of this property are a restaurant, room service and luggage storage space, along with free WiFi throughout the property. Uttoxeter Racecourse is 700 metres from the property. The rooms in the hotel are fitted with a flat-screen TV. Every room comes with a private bathroom with a bath, bathrobes and free toiletries. Guest rooms will provide guests with a desk and a kettle. A Full English/Irish breakfast is available daily at the property. Alton Towers is 10 miles away. Award winning, family run guest house close to Alton Towers. Within easy walking distance of town centre pubs and restaurants, Uttoxeter racecourse, and railway station. Ample parking. Boasting a central location in the historic town of Uttoxeter just 20 minutes from Stoke-on Trent this charming Georgian-era Hotel offers free Wi-Fi access and secure on-site parking. The property was built in 1777 and served as the first bank in Uttoxeter. To this day the Hotel still retains many of its original features such as the bank vault and a beautiful unsupported oak staircase. Emphasising both comfort and relaxation Each of the en-suite bedrooms are individually styled and furnished. Double Twin& Family options are also available as well as luxurious four-poster rooms. The Hotel is just a 25 minute drive from Junction 14 off the M6 20 minutes from Stoke-on-Trent and less than 30 minutes from Derby. It is the perfect base from which to explore the area s many nearby attractions including Uttoxeter Racecourse The Potteries Chatsworth House Haddon Hall and Alton Towers Theme Park. Please note that the whole price of reservation will be charged to your card 24 hours prior to stay. If payment does not go through the hotel will ask for new card details. If new card details are not received the hotel will cancel your reservation. Meadows Way Guesthouse is a well established Guest House situated in the centre of the beautiful market town of Uttoxeter on the A50 halfway between the M1 at Derby and the M6 at Stoke on trent. We offer 14 well appointed fully en-suite bedrooms Single rooms Double or Twin rooms a Romantic 4 Poster room and family rooms for up to 5 people. All of our rooms are equipped with tea & coffee making facilities and colour Freeview TV s and are finished to a very high standard. Meadows Way Guesthouse was recently award The Certificate of Excellence Award by Trip Advisor. You will be assured of a very warm and friendly welcome and a comfortable stay at Meadows Way. We pride ourselves on our Full English Breakfast all of which are individually prepared from locally sourced ingredients and we are very proud to be rated as 5 Gold Stars by Rate My Place and The East Staffordshire Borough Council. We are conveniently situated for The Uttoxeter Race Course Alton Towers The Staffordshire Showground The Stoke on Trent Pottery Trail The East Midlands Airport The Peak District and The Derbyshire Dales. In the centre of Uttoxeter, this beautiful Georgian building was once the town's first bank and now offers free parking, a bar and 17 individually decorated en suite rooms. Originally built in 1777 for Thomas Hart, the Bank House Hotel has a great location, right in the heart of Uttoxeter's town centre. All that this charming Staffordshire market town has to offer is nearby and Uttoxeter Racecourse is within walking distance. Alton Towers is just a short drive away. The hotel maintains original features including a fine, unsupported oak staircase. There is a Thai restaurant within the building, housed in the original bank vault. Free private parking is available on site. many with ensuites, all have tea and coffee trays. 3 miles from J14 of M6, free parking. 4 acre gardens, sun room, library, chapel, free WiFi, TV room and Bar. Christian run B&B, conference and retreat centre for those of all faiths and none. A stylish and well run independant hotel with an excellent reputation for friendly staff food and service. This thriving venue has long been established as a bar restaurant and conference centre and in late 2007 added at the rear of the complex 21 tastefull decorated modern style bedrooms all en-suite with double beds and free wi-fi. Located just off the M6 and one mile from Cannock town centre it s location is easy to find and ideal for visits to Cannock Chase Staffordshire and the Midlands. A real find for accommodation - try it! A Warm Welcome awaits you at The Old Baker s Cottage Bed & Breakfast. Situated in the delightful village of Newborough Burton upon Trent in the heart of Staffordshire. br / br / br / br / Our rooms are decorated in a boutique style and are extremely welcoming and comfortable and have colour TV with freeview Tea/Coffee making facilities Bath Robes and Slippers and free wireless internet connection for your laptop. br / br / br / br / Our B&B is ideally based for business or pleasure. About 15 mins drive to Tamworth Lichfield and Burton-upon-Trent (the Brewing Heritage Centre) is 10 mins away. Hoar Cross Hall Health Spa is just over a mile away. Also within easy reach is East Midlands Airport. The new FA ground at St Georges is just a few minutes away. We are also handy for Uttoxeter (Racecourse) and Derby. The new St Georges FA Ground is less than 2 miles away. br / br / br / br / For the thrill seekers Alton Towers Theme Park Drayton Manor Theme Park & Zoo Tamworth Castle and Gullivers Kingdom Theme Park are all only around 30 mins drive away. br / br / br / br / Wedgewood pottery Royal Doulton along with numerous stately homes/National Trust properties such as Shrugborough Hall Sudbury and Keddleston are only a short drive away also. br / br / br / br / For walkers and cyclists enjoy the stunning scenery of the Derbyshire Peak District including Dovedale Ashbourne Bakewell The Roaches Manifold Trail High Peak Trail and Tissington Trail. br / br / br / br / For that touch of luxury we have Hoar Cross Spa 1 mile away. Tutbury Castle and Abbots Bromley are very close by home to Abbots Bromley School for Girls and the Horn Dance. br / br / For the aviation enthusiast why not visit Tatenhill Aviation for a flying lesson. br / br / The National Memorial Arboritum at Alrewas is 11 miles away. br / br / br / br / Visit our website for more photographs and for details of our Vintage Tea and Coffee Rooms with Tea Garden in the summer where we specialise in homemade cakes and cream teas. br / br / br / br / Nearby we have a number of lovely villages with a good choice of pubs with restaurants. A Warm Welcome awaits you at The Old Bakers Cottage in the delightful village of Newborough, B.O.T in the heart of Staffordshire.Free WIFI,nr Hoar Cross Hall,Alton Towers,Peak District, St Georges FA, Abbots Bromley, Lichfield, Burton upon Trent, Derby. Set in a 17th-century building with original fireplaces and oak beams, The Littleton Arms serves local produce on a seasonal menu in its restaurant. Located in the quaint village of Penkridge, the M6 motorway is just a 5-minute drive away. Stylish feature wallpaper, free Wi-Fi access, a satellite TV and a hairdryer are in each individually decorated room. All rooms at the Littleton also have a private bathroom with a selection of toiletries. A full English breakfast is served daily and a contemporary British and Mediterranean menu is available each evening in the restaurant. A range of cask ales and international wines are served in the modern bar area. Penkridge's historic town centre is just 150 metres away and Penkridge Rail Station is less than 5 minutes' walk from this guest accommodation. Free parking is available and Wolverhampton city centre is just 20 minutes' drive away. Situated in Meir, the Weathervane Hotel is 20 minutes' drive from Alton Towers. With a family friendly restaurant, lively bar and children's playground, the hotel offers free parking and free Wi-Fi. The individual rooms at the Weathervane Hotel each have a private bathroom and tea/coffee facilities. All rooms are spacious with modern decor, and feature a TV, hairdryer and radio. The Hungry Horse Restaurant serves a variety of light lunches and full meals, and a children's menu is also available. The popular bar offers a range of snacks and beverages. Just 10 minutes' drive from Stoke-on-Trent centre, The Weathervane Hotel is a 15-minute drive from Newcastle-under-Lyme. The Peak District National Park can be reached in 20 minutes' drive. Situated in the small market town of Cheadle, The Huntsman is a country pub and restaurant 16 minutes' drive from Alton Towers Theme Park. With free on-site parking and free Wi-Fi, it also includes a TV area, darts room, beer garden and children's play area. The modern rooms at The Huntsman each feature an en suite bathroom with complimentary toiletries, tea and coffee making facilities and a TV. Some of the rooms even benefit from a fireplace. For food, a full English breakfast is served within the cosy restaurant. A continental breakfast is also available. The extensive lunch and dinner menu has an emphasis on hearty home-cooked food. The pub offers frequent entertainment nights throughout the week. Guests can enjoy a wide selection of real ales whilst testing there knowledge at the pub quiz, or by enjoying the folk music sessions. The Peak District National Park is less than 10 miles from the Inn and St. Giles' Catholic Church is just 2 minutes' drive away.